The best way to do latent class analysis is by using Mplus, or if you are interested in some very specific LCA models you may need Latent Gold. Another decent option is to use PROC LCA in SAS. All the other ways and programs might be frustrating, but are helpful if your purposes happen to coincide with the specific R package. CRAN offers plenty of different ways to get clusters on your data, but most of these packages have a very narrow and specific utility. For example, I found at least 15 packages involving latent class models, of which only six perform latent class analysis in the form of classification based on indicators, and only two of them allow including nominal indicators, and none allows including ordinal indicators. First, there are all kinds of mixture models whose main purpose is to look for the classes in which the regression parameters differ. The meaning of the latent classes here is different as they are based not on the responses of respondents, but on the effects of one variables on other. These packages include flexmix, fpc, mmlcr, lcmm, and others. I do not discuss them. Second, there are updated Lazarsfeld’s latent class models whose main purpose is to obtain a discrete latent variable based on the responses of respondents. These models look for homogeneous (in terms of responses) classes which differ by responses. Optionally, one can add some predictors and distal outcomes (variables that depend on classes but not their indicators). NONE may utilize ordinal responses (although poLCA manual insists there is no big practical difference with treating responses as nominal ones). NONE can apply 3-step approach in adding covariates. Below I describe three packages that allow for nominal indicators: poLCA, depmixS4, and lcca. Latent classes based on nominal responses (only), may add predictors of all latent classes (in one stage). and poLCA gives class probabilities, conditional response probabilities and the fit statistics. The output is clear and simple. repeats fitting the model as many times as you like, and manipulate convergence criterion and number of iterations. builds graphs automatically, although not always these graphs are useful. in the manual the authors defend one-step approach of adding covariates using outdated publication by Bolck, Croon and Hagenaars (2004), whereas adjustments to the three-step approach were suggested a while ago (Vermunt 2010) and successfully implemented in LatentGold and and Mplus software. You can’t even do it manually with poLCA. Example. I use WVS round 5 data from Canada and three items on trust: generalized interpersonal 10-point trust scale, and two 4-point scales of trust to family and trust to strangers. The input commands are very simple, excluding an odd need to cbind the LCA indicators. So, there are two classes and their profiles are nicely plotted, though the plot isn’t too informative as it’s hard to compare class profiles. Entropy wasn’t calculated in my case. All the other functions worked smoothly. lca.polca$predclass gives a vector of predicted class membership for each respondent. lca.polca$posterior gives a matrix of probabilities for each respondent and each class. You may add predictors to the model by substituting ~1 with ~predictor1 + predictor2… But be careful, it applies one-step approach which means the classification will depend not only on your indicators, but on the predictors too. The package allows to fit various kinds of hidden Markov models, to which LCA model is also generalized. To avoid time-consuming mistakes in model specification, the analysis involves two steps: construction of a model with mix function and fitting it with fit function. family argument of mix function allows specifying a type of observed variables – whether they are continuous, nominal, or count by adding to a list corresponding distribution name, i.g. guassian or multinomial. Due to its different main purpose (which is latent transition modeling of time series), terminology differs from conventional LCA. Classes are called states. Some basic functions are needed to be specified manually: There is no easy way to plot probabilities; no G2 or X2 values, no entropy. multinomial("identity")), # should be indicated in the list. Loglikelihood values as well as AIC and BIC are very close to the ones found in with poLCA. summary function shows found probabilities of classes and conditional response probabilities. St1 here stands for state 1, which is class 1. Re1.1 stands for variable 1, response to category 1, in my case it’s trust to family item, response “Trust completely”. 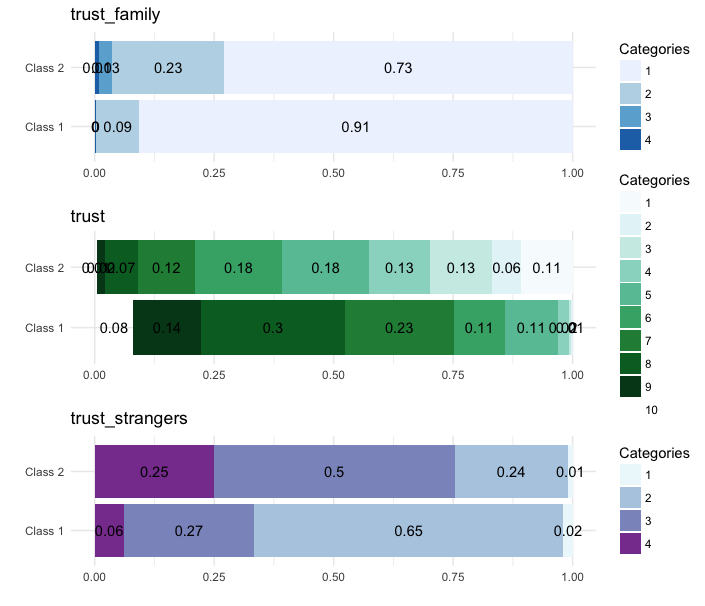 Taking together, a probability of a respondent to give response “Trust completely” to the question about their family given this respondent is member of latent class 1 is 0.9070074, or, rounding 0.9.
fit.mod@posterior gives a predicted class membership variable and posterior probabilities of membership. The table of results shows that first and third indicators have multinomial responses, hence it shows probabilities for each response category given the class membership. The second indicator is continuous, so it has two parameters Re2. (Intercept) which us mean, and Re2.sd, which is standard deviation. this is my favorite, although it’s a dead-born package – since publication of 2.0.0 version in 2013 it hasn’t been supported, it’s an alpha software, it runs only on Windows, and owners of the package are not together anymore (the developers seem to switch to PROC LCA instead). I hope there will be some progress and they will find a way to keep developing lcca. In addition to classic LCA with nominal indicators, it can do a multiple group LCA models and fix or relax all the response probabilities. Like poLCA it allows to add covariates that have an effect on class probabilities (class sizes). It allows to compare likelihoods of several models with the same number of classes and differing covariates. Another nice feature of this package is its ability to account for sampling weights and specific features of sample, including sampling clusters and strata, which is very useful given your using of survey data. You can also “flatten rhos” which means avoiding too large and too small thresholds corresponding to conditional response probabilities (it’s often appears). Furthermore, it implements the LCA version of Rubin causal model, but I am not sure how popular it could be among social scientists. In order to perform multiple groups LCA, just add groups argument to the above input and specify whether you want conditional response probabilities (constrain.rhos) and class probabilities (constrain.gammas) to be equal or not. When adding predictors make sure to change the function to lca.cov. A specific post about multiple groups LCA in different software will follow. This entry was posted in English and tagged lca, r on December 28, 2016 by maksimrudnev. What would you say about the ‘covLCA’ package? Thanks for pointing it to me, Aline, I will definitely have a look and make an update to my post.